There are seven levels and/or types of Courts that sit in four different courthouses in the Halifax Regional Municipality. They include the Nova Scotia Court of Appeal, the Nova Scotia Supreme Court, Supreme Court - Family Division, Provincial Court, Small Claims Court, Bankruptcy Court and Probate Court. The Court of Appeal and the Bankruptcy Court both serve all of Nova Scotia but sit only in the Law Courts building on Upper Water Street in Halifax. 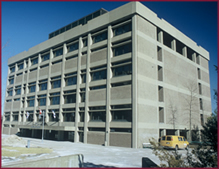 The Law Courts is is also where Supreme Court and Probate Court matters are heard for the Halifax Regional Municipality. The Supreme Court - Family Division sits in the courthouse on Devonshire Avenue in halifax (see photo at right). 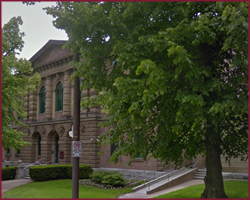 The Halifax Provincial Court and the Small Claims Court are in the courthouse on Spring Garden Road in Halifax (see photo below). 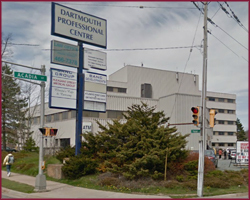 The Dartmouth Provincial Court is located on Pleasant Street in Dartmouth (see photo below, to the right). 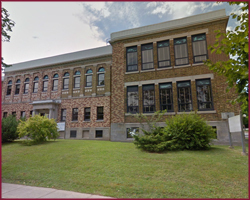 The YOUTH JUSTICE COURT >> sits in the courthouse on Spring Garden Road and the MENTAL HEALTH COURT >> sits in the courthouse in Dartmouth.